JAMMU/SRINAGAR, Jan 20: After fresh snowfall in Jawahar Tunnel area of Pir Panjal this evening, the Jammu-Srinagar National Highway was closed while four flights were canceled and several others remained affected at Jammu and Srinagar airports due to bad weather today. Several link roads in Doda, Kishtwar, Ramban, besides Rajouri and Poonch were also closed this evening after rain and snowfall while Udhampur-Ramnagar road was blocked due to land slides near Kuh Nalla this evening. While the tourist resorts- Patnitop, Natha Top and Bhaderwah experienced fresh snowfall this evening, Rajouri-Dera Gali-Surankote road was closed due to snowfall. Trikuta hills of Mata Vaishnodevi also experienced snowfall but the pilgrimage was moving smoothly. Chopper service from Katra base camp to Sanji Chhat remained suspended for several hours during the day today due to bad weather. However, the yatra remained smooth. IG Traffic, J&K, Alok Kumar told the Excelsior that after snowfall in Lower Munda and Jawahar Tunnel area this evening, the traffic on Jammu-Srinagar National Highway was stopped. He said the movement of traffic from Banihal and Qazigund side was stopped at around 5 pm. Earlier, around 3000 vehicles crossed towards Jammu from Kashmir side. There was one way traffic from Kashmir to Jammu today while equal number of vehicles said to have stranded on other side of the Jawahar Tunnel, he added. Responding to a question, IG Traffic said since the MeT department has predicted bad weather during next two days, the situation along highway will be reviewed tomorrow morning and if the weather remained fair, the highway will be restored and traffic allowed from Jammu to Srinagar. SP Airport Jammu, Mohd Aslam said that due to fog and bad weather, four flights were cancelled today. They included two Spicejet and one each of Go Air and Indigo. He said the other flights were however, almost on time. 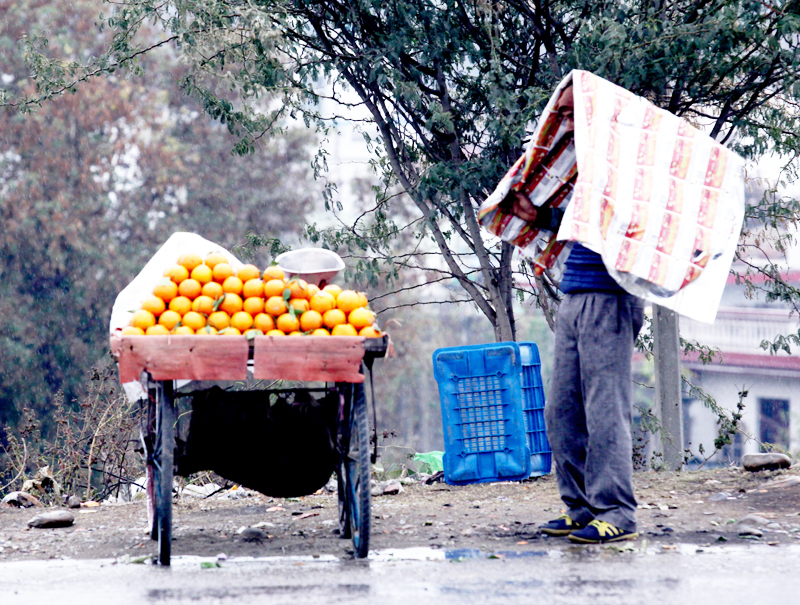 Due to rain in parts of Jammu, the cold wave has gripped the whole region and people mostly remained indoor today. The rain continued since 4 pm in many parts of the region while it was snowing at the higher reaches including parts of Patnitop, Bhaderwah, Doda, Kishtwar Dera Gali and Budhal in Rajouri and many parts of Poonch and Udhampur. Loran and Sawjian roads in Poonch were also closed late this evening due to fresh snowfall. A MeT spokesman said that there would be moderate to heavy snowfall for next 36 hours in Kashmir valley and parts of Jammu region. “System is now concentrating as a result 36-hour moderate to heavy spell of rain and snow is expected,” he said. The Divisional Administration today issued high danger avalanche warning for higher reaches of Baramulla and Kupwara districts and medium danger warning for Poonch, Rajouri, Kishtwar, Anantnag Bandipora, Budgam, Ganderbal and Kargil districts and low danger avalanche warning for Ramban, Doda, Kulgam and Leh for the next 24 hours. The people in the avalanche prone areas of these districts have been asked not to venture out of their homes. The weather in Kashmir this morning slightly improved with an increase in the minimum temperatures due to a nightlong cloud cover. A Meteorological Department official said that the minimum temperatures improved due to night long cloud cover in Kashmir. He said that Srinagar recorded minus 0.3 degrees Celsius as the minimum temperature today as compared to Saturday’s minus 3.0. The day temperature settled at 5.6 degrees Celsius. Similarly, the minimum temperature improved to minus 3.0 degrees Celsius in Pahalgam compared to Saturday’s minus 4.4. Gulmarg recorded minus 4.6 degrees. The day temperatures at Pahalgam and Gulmarg settled at 5.0 degrees Celsius and 0.5 degrees Celsius. Leh town had minus 9.7 degrees Celsius while Drass town of the Ladakh region recorded minus 12.8 degrees as the night’s lowest temperatures. The maximum temperature at Leh settled at 4.6 degrees Celsius. Jammu recorded a minimum temperature of 9.5 degree Celsius and maximum 20.0 deg C, holy township of Katra maximum 18.7 deg C and minimum 10.6 deg C; tourist resort Bhaderwah maximum 12.8 deg C and minimum 2.0 deg C while Banihal maximum 11.5 deg C and minimum 2.2 deg C today. The MeT Department has predicted rain and bad weather at most of the places in the region during next two days.